Home › Australian Solar › Pallamana solar plant and battery in the works. Pallamana solar plant and battery in the works. Pallamana solar plant – the suburb in South Australia will receive a 176MW PV solar plant and a battery storage system as part of plans released by renewable energy company RES. 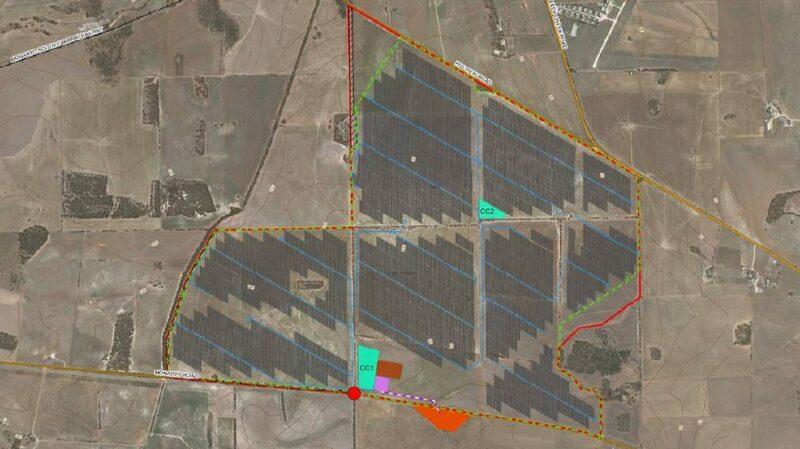 It gained “Crown sponsorship” in February and is one of two Murraylands solar projects (The other is Vena Energy’s $200m solar farm at Tailem Bend) currently in progress. A 730 hectare site, which is currently used for cropping, could generate enough electricity to power 82,000 homes. This would result in co2 emissions decreasing by more than 140,000 tonnes per year. RES are planning to apply for DA (development approval) within the next month and then begin construction Q2 next year. The site is located in between Hillview Road and Monarto Road, just south of the Pallamana airfield and approximately four kilometres from Murray Bridge. It’s also adjacent to a power substation, (which you can see in orange on the picture above). No word yet on the specifics of the project but we’ll be sure to update you as soon as we know what sort of equipment they’ll be using. Of particular interest is the solar battery which hasn’t even got a size yet – so we’re not sure exactly what they’ll end up doing with regards to energy storage. The project is expected to create 200 solar jobs during construction and around 320 down the supply chain (accommodation, hospitality, cleaning, and so on). Hopefully RES hire as many locals as possible – there is a lot of solar talent in South Australia! It’s not all peaches and cream for everyone involved, however – local aviation students have been known to make (infrequent, but necessary) emergency landings in the field where the solar panels will be installed and local residents told a meeting the rows aren’t wide enough for a light aircraft and they were concerned about what would happen in an emergency. Councillor Fred Toogood said the proposal was ‘exciting’ and that ‘we’ve got to be open to this sort of thing’ so we’ll see how they resolve the aircraft issue over the next month or so. As per the Murray Valley Standard, if you’re a local and would like more information about the proposed Pallamana solar project, please visit www.pallamana-solarfarm.com or call 1800 118 737.